Nepal’s first King, Prithvi Narayan Shah, is supposed to have remarked that Nepal was like a yam squeezed between two giant boulders – referring to India and China, of course. The implication was that Nepal needs to carefully balance its relations with its two giant and powerful neighbors to achieve its own ends. But later Nepali kings and regents tended not to heed those words well, and embarked on adventures that drew in the Chinese and the Indians. Prithvi’s son, the ambitious expansionist Bahadur Shah, got into a scuffle with Tibet that eventually drew in the Chinese. By the time that was over, the Chinese were well within Nepal and only 30 kilometers from Kathmandu. However, Nepalese proved formidable, and the Chinese advanced no further. Still, the adventure was a major drain on Nepal’s resources and as a result Bahadur Shah lost a great deal of face and power. He would spend his last days in prison. Today, however, Nepal finds itself in a unique position. It is being courted by the very powers, India and China, that for so long had treated it as a peripheral concern. What has changed? For one, internal politics within both India and China are now both quite different. This is especially noticeable in India, with the election of the Hindu conservative Bharatiya Janata Party. The Hindu right in India has long emphasized the cultural and religious links that bind the two countries and had always taken pride in Nepal being the only officially Hindu country in the world. That changed with the declaration that the country had become secular in 2008, a change that many Hindu conservatives in both India and Nepal have never really accepted. Indeed, there is a growing movement within Nepal to hold a referendum on the issue. For conservative Hindus, then, such as those that now lead India, the issue of Nepal’s secular status is an emotional one. The sudden Chinese attraction to Nepal, however, is less easy to understand. China has no real cultural links to Nepal. Hitherto, its only connection was through Tibet. Nepal and Tibet, of course, have long had relations, with much intermingling of peoples along the border regions. Historically, China has evinced little enthusiasm for Nepal. When, during the Anglo-Nepal era, the Nepali strongman Bhimsen Thapa asked the Chinese in Tibet for help, he was firmly rebuffed – several times. The Chinese representatives in Tibet told him in no uncertain terms that China had no obligation to help Nepal. In later years, it would be Nepalese rulers who turned down Chinese overtures. The dictator Chandra Shumsher Rana refused a Chinese offer for Nepalese to join the five races of China, replying that Nepalese were Hindus and therefore could not be a Chinese race. Nepal’s relations with China really began to improve under the leadership of King Mahendra Shah. In many ways, Mahendra Shah was the closest modern analogue to Prithvi Narayan Shah. Like his ancestor, he was realistic, but cautious in his foreign policy and maintained a fine balance between India and China. Fearing that India had obtained too much influence in his country, he opened his country to the Chinese, but not to the point of antagonizing India, whose sensitivities towards increasing Chinese influence in South Asia he understood well. His son, Birendra Shah, was less cautious and swung quite overtly towards the Chinese side. During the brief democratic period that preceded the absolute monarchy under Mahendra, Prime Minister BP Koirala also tried to balance the influence of his two giant neighbors. Raised in India and having close relations with the Indian leadership, Koirala nevertheless behaved much as King Mahendra would subsequently do. Unfortunately, the fine art of balance seems to have been lost on the current generation of leaders, who, if they have an interest in foreign policy at all, seem too close to either the Indian or the Chinese side. The geographical and economic reality of Nepal is such that the country must necessarily be closer to India than to China. In the dying days of King Birendra’s absolute rule, India imposed an economic blockade on Nepal that brought the latter almost to its knees – underscoring just how one sided but important that relationship is. The royal regime then tried to curtail the shortfall by supplying the country with provisions from China, but that was clearly inadequate. The lesson was clear: Nepal needed India. That lesson has not been lost on today’s leaders, even those who wail at India at every opportunity. 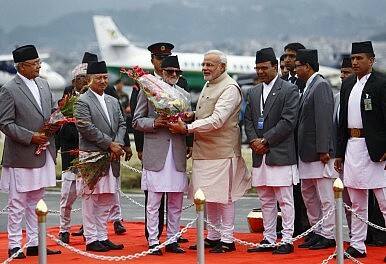 China, and indeed other countries, may help to lessen Nepal’s dependence on India, but they cannot replace it. India is still the biggest destination for Nepalese migrants, a position it has retained since the Anglo-Nepal war ended in 1815. Today, estimates of the number of Nepalese working in India range from over 800,000 to more than 1.7 million. The earlier figure, estimated by the World Bank, is likely a severe underestimate. Even so, it is greater than the sum of all Nepalese economic migrants elsewhere in the world. Others estimate that about 40 percent of Nepalese migrants are in India. Whatever the correct figure is, the fact is that Nepal has been, and continues to be, bound to India in a way that it is not with other countries – and for the most basic reason: livelihood. Thus, news that China has constructed a railway line to the Tibetan city of Shigatse (Xigaze), only about 500 kilometers from the Nepali border, and that it has shown an interest in extending the line to Nepal has been met with some jubilation in Nepal, as if that would go a long way in lessening Nepal’s dependence on India. But it is unclear how much Nepal can benefit from the link. Although smaller than Nepal-India trade, China-Nepal trade is also extremely unequal. Like India, China has also promised Nepal several goodies, including grants and investments. But Chinese Foreign Minister Wang Yi, who visited Nepal recently, made it clear that his country was not in competition over Nepal with India, and he rather saw Nepal as a bridge between his country and South Asia. That seems to sum up the overall relationship that China wants with Nepal – as an area of some influence, but not to the extent that it is in direct competition with India, so as to help it develop relations with the rest of South Asia. Considering the nature of the historical, cultural and economic linkages between the two countries, that would appear to be a pragmatic choice on the part of China.